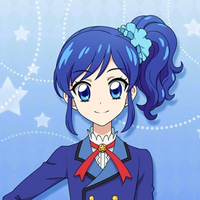 Casting Call Club : Aikatsu voices singing Love Live songs! 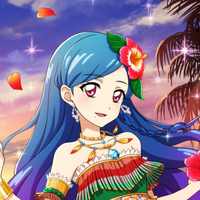 Casting Call for Aikatsu voices singing Love Live songs! Aikatsu voices singing Love Live songs! About Aikatsu voices singing Love Live songs! Hello! Since you clicked on this it seems like you are either interested in the Love Live! 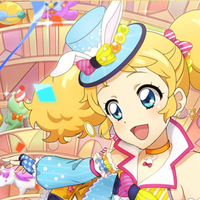 or the Aikatsu part. Well, since I've always wanted to be the leader of my own cover group, I decided to make one. Considering the amount of Love Live! cover groups that already exist, making a normal one could end up being just one of many. So, I decided to add a twist! An Aikatsu - Love Live Cover group! Now.. Surely there are cover groups that cover songs from both Love Live! and Aikatsu. But that's not what I mean by that anyways. My plan for this will be that we'll sing Love Live! 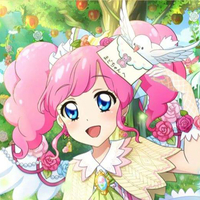 songs in the voices of Aikatsu characters. Because I think that could be interesting. I already have held this Casting Call a few months ago, but now I need to recast some people, since I have 6 precious members though, the most I'll accept are 3 new people. I will be responsible for the organization, the art and the sprite edits for this. While I would be the leader of this group, two of my members are co-leaders to keep it more organized. However.. lets get into the rules and other important things. - Be okay with voicing at least two characters! This will be a 9 people group, maybe not even, so you'll have to be okay with voicing at least two of the characters, I'd prefer it if you're also confident in both those voices and don't strain your voice doing them. - You'll be needing Discord, since that will be our main way of communication. -Have a decent mic, I'm not asking you to have a pro - mic but at least something that gives me the possibility to clearly hear you. -Be active! I am looking for people that are actually ready to dedicate their time to this. I prefer to know the people I am singing with so I'd appreciate it if you'd be able to spend some time in the group chat at least twice a week. -Deadlines! I will need people who are actually able to hand in their lines in time, singers will have about 1-2 weeks depending on the song. Mixers will have a little longer, again, depending on the song. -Be nice! I don't want to have any racism, sexism or anything in the group chat and I would appreciate it if you'd speak to one of the leaders if you have problems with another member, before starting a fight. -Be okay with critism! I want this group to be able to improve together so it would be good if you are able to take criticism. -We will be singing in japanese! So make sure you understand the pronounciation to some level. -Try to sound as close to the character you're auditioning for as possible! I will be rather picky about these voices so try your best but please don't strain your voice. -Be at least 13! I'd prefer it if you were 14 or older but this is to ensure at least some maturity in the group. I don't want people to start fights because of childish behavior. -And last but not least, have fun! I don't want you to sound bored while singing. I want to be able to hear that you are having fun. I already created a Discord for this so if you want to join, you can also just be a viewer. People familiar with Love Live! know of the sub-units it has. I won't be as strict with the sub-unit songs and the sub-units in general since I want to keep some of the Aikatsu touches. 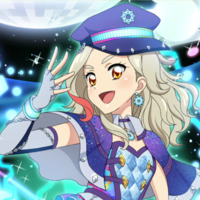 Since Aikatsu has units, we saw that people can be in different ones at a time and that it doesn't matter if a song was already sung, it can be sung again. While I won't allow a complete copy, as in completely the same singers, completely the same song, I will allow you to sing a song multiple times, sub-units don't matter either. So just because you are casted as the person who sings Mari's parts it doesn't mean you can only do sub-unit things with the other members of Guilty Kiss. I'm planning on releasing at least one cover each month with a few sub-unit songs here and there. If you read through all this, have fun auditioning! You are allowed to audition for as many characters as you'd like but I'd prefer if you'd audition for at least two or stated which other characters you could sing as if I casted you. Ichigo is the typical female anime protagonist. She's a cheerful, gung-ho girl, who's always willing to help out friends and strangers alike. A stubborn airhead, but definitely shares certain characteristics with her mother, Ringo. Her Achilles' heel is that she can push herself too much, which can make her lose sight of her original goal at times. She's very straightforward, and sometimes has difficulty understanding certain situations, but her determination and hard work allow her to overcome any and all obstacles that hinder her. One of Ichigo's most defining personality quirks is her love for food. This is a running gag throughout the series, since there isn't a single dish she dislikes, and she has a humongous appetite, which is a trait she inherited from her father. 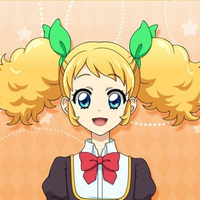 Ichigo's personality is known to be most as the moe type, meaning that she is, above all, cute. She displays the some of the most common traits like air-headed-ness, determination, cheerfulness, and in some cases genius-level abilities. Her voice is rather cute as well. It isn't too high though. It is more of a mezzo-soprano voice and its's pretty upbeat. Try to do an impression but don't force your voice. That just doesn't sound good. Sing a song from Love Live! 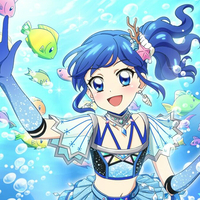 Sing a song from Aikatsu! Aoi is a calm and bright girl. She is very intelligent, possessing an encyclopedic knowledge and excellent analytical skills. She is highly determined towards her goals and approaches them very seriously. Aoi makes sure to plan ahead and research as much as she can for a situation. She is hard-working and has a bit of a perfectionist streak. Her voice has a bit of a special touch to it. It's medium-high and rather upbeat. Her voice is very bubbly and medium-pitched. She is very upbeat in general so try to capture that! 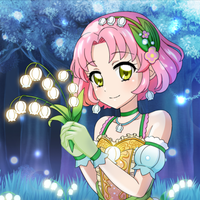 Yurika is usually quiet and soft spoken. She created her vampire character, based on an old vampire romance manga, in order to stand out at Starlight Academy. When in character she is confident and proud, however there are moments when she lets her character slip. When this happens her personality is that of a tsundere. She likes garlic flavored noodles, a fact only Ichigo and her friends know about, and has it delivered to her. Her vampire character is very popular both within the academy and the outside public. 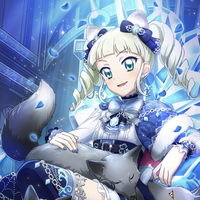 Yurika's voice is a lot deeper than most of the other voices, it is good for rock songs but can also sound good in energetic and cheerful songs. In energetic songs, she uses a higher voice than she uses in rock songs. Sakura is a very calm, polite, and soft-spoken girl. She is very friendly and a hard worker, like Ichigo. 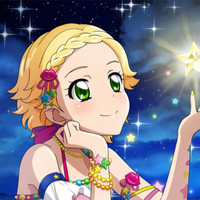 Upon her arrival at Starlight, Ichigo was assigned to be her senpai. Since then, she and her friends have helped Sakura gain confidence in herself, and develop friendships and companionships among each other and the rest of the Starlight community. By season two, Sakura has become more confident and assertive, though she still retains some of her soft-spoken nature. Her voice is very calm and soft. It's rather medium-pitched but it can get high-pitched. Having come from America, Kaede uses a lot of English phrases and has a habit of kissing people she meets on the cheek. She is friendly and has a fascination with magic. She enjoys performing various tricks and ensures that her fans are having a good time. Kaede does occasionally make large scale entrances skydiving for example into the Tristar auditions. 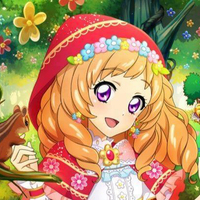 Her voice is rather deep like Yurika's but compared to Yurika's voice it's more upbeat in general. 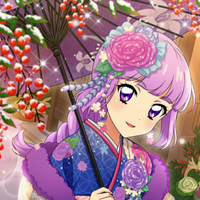 Sumire is a very beautiful girl with a calm disposition and is kind, soft-spoken, and polite. She has always preferred being by herself, but this began to change when Akari became her roommate. She loves LoLi GoThiC and fortune-telling and is commonly seen carrying tarot cards with her. Her voice is rather soft and medium-high-pitched voice. She is able to have a stronger sounding voice as well though. 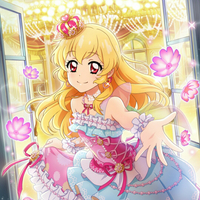 Hinaki is an energetic girl with an informal manner about her that allows her to get along well with others. She's been in the entertainment business since childhood and thus has more knowledge and experience compared to most idols her age. Because of this, she'll sometimes feel insecure as nothing she says sounds fresh. She's a very fashionable girl and enjoys being so. She likes to dress up in coords and feels that there are clothes that suit everyone. Her voice is pretty playful and a little bit childish. It is rather high-pitched. Juri is described as being "hot" by Akari and many others. She is very passionate about becoming an actress and is very passionate in general. She's also very hard-working and aims to become an actress all her own. Her voice is a little deeper but she is able to reach a high pitch. She sounds very passionate about what she does and I'd say her voice is upbeat in her own way. She's a sweet, yet unexpectedly firm girl, who's shown to be a tease around her friends. 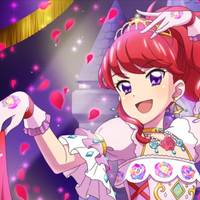 Madoka actually has a lack of self-confidence in how she performs, like at the debut live for Skips or when she asks her grandmother for a premium rare dress. A notable trait of hers is that she is very honest, which is often noted by her friends. Her voice is suprisingly mature. It's not too deep though, it is more of a medium-pitch which is able to go high-pitched. Other than that, her voice is mature but soft at the same time. Rin has an energetic nature with a cooling and calm personality. She is passionate for dancing and always remembers to have fun. She easily gets flustered when teased or complemented by others. Her voice is a bit deeper but still medium-pitched. It's pretty much what you would expect from most tomboys in anime. She is able to sing in a higher pitch as well though. 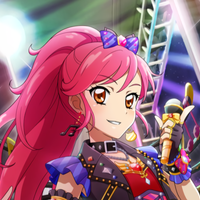 Seira is a leader type who loves rock. She comes off as confident and bold, but she's actually pretty shy and very humble. She is often seen giving Kii Brain Thunder when she is researching and/or collecting data. She loves cats and is sometimes seen playing her guitar. Her voice is better in rock-songs, which doesn't mean she isn't able to sing typical idol songs though. Her voice is deeper than most of the other voices but it has the same energy. 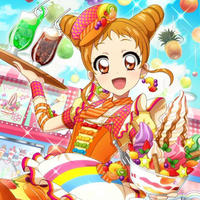 As a pop-type idol, Kī is very cheerful and energetic. She has a habit of saying certain words twice or even thrice before ending a phrase or sentence. This is revealed to be an influence from her mother who would do the same. Kī states that her mother is "her producer", having been her main boat of support and confidence in her childhood. Her voice sometimes has a little bit of a childish touch to it but it's kept to a minimum. Normally her voice is rather sweet and warm and medium-pitched. 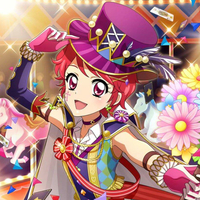 Sora is a talented designer whose calm and easygoing with her fellow peers. She's fond of the Bohemian culture, (hence the foundation of her brand,) and loves nature and animals - especially her pet cockatoo, Palm. Sora's voice has a very sweet touch to it. It's rather high-pitched. I'd compare it to Nozomi's (Love Live!) voice. Maria is a kind, gentle and soft-spoken girl. She is very considerate, as shown in episode 69, when she took into account everyone's likes for her house party. Maria is very sweet and good with cosmetics. Her voice is warm, soft and sweet. It's really pleasant to listen to. Since I am personally rather untrained at mixing, I'd prefer to have someone else with more experience mix for this group. 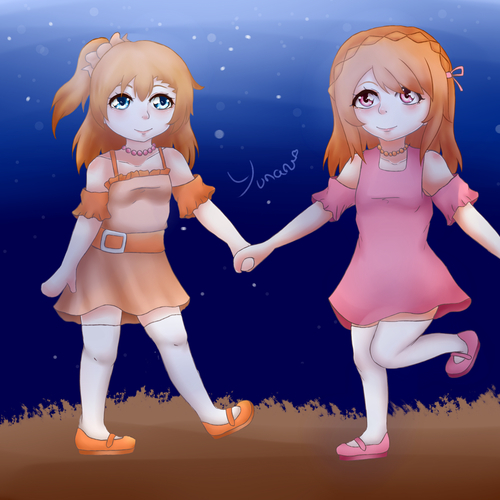 Since we will be doing Love Live! covers, you should be able to mix at least 9 people together. Video-editing is also something I don't feel confident in yet, so again, I'd prefer it if someone more experienced would do it for the group.